A Guide to Program Development and Implementation is designed for managers, supervisors and workers involved in the development or implementation of an organization’s workplace violence prevention policy. Participants will learn to recognize the risk factors associated with workplace violence and will examine the components of an effective workplace violence prevention program. 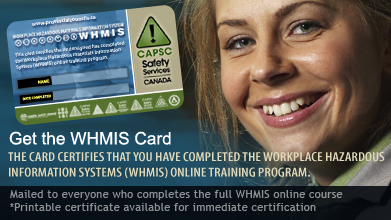 WHMIS 2015 Online is 100% compliant with the general WHMIS training requirements in 2018. 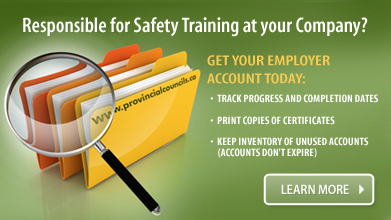 Employers must also provide workplace-specific training and instruction for each hazardous product in the workplace. WHMIS 2015 came into effect with a transition period that ends December 1, 2018. Until then, there may still be materials on-site that comply with the older, WHMIS 1988. To ensure the safety of workers, this course educates participants about both WHMIS 2015 and WHMIS 1988 labels, classifications, and (Material) Safety Data Sheets. Workplace Harassment Training is a three-unit course designed for both management and non-management workers. Upon completion, individuals should be equipped to recognize and properly address workplace harassment and to prevent such situations when possible. This program explains the importance of Lockout-Tagout in safeguarding workers who operate machinery or processes in industry. The basic tenets of safety are explained as are the specific stages and procedures of the Lockout-Tagout process. Fire Safety is a basic awareness program for workplace environments that includes prevention techniques as well as information on how to use a fire extinguisher. This course is designed to give the participant, the knowledge in fire safety and prevention, fighting a fire by recognizing user and equipment limitations, the fundamentals of fires, types of fire extinguishers, and the proper handling of the fire extinguisher. Due Diligence for Supervisors explains the philosophy of the Internal Responsibility System (IRS), which forms the basis of all occupational health and safety legislation in Canada, and examines the measures that must be taken to ensure compliance with OHS laws. The program defines due diligence as it applies to occupational health and safety and identifies specific measures that must be put in place to meet the requirements for due diligence. Canada Labour Code, Part II, is intended for employers and employees, members of health and safety committees and representatives who are covered by Part II of the Code. Generally speaking, the Canada Labour Code establishes the legislative framework and outlines the duties and responsibilities of the employer and employees pertaining to occupational health and safety.